When is a ham a Black Forest ham? Black Forest ham is made from selected gammon. It is finely seasoned in accordance with traditional recipes and salted by hand, after which it remains in “salt” for a couple of weeks. Subsequent to this, the ham is smoked with a mixture of green pine twigs, sawdust and wood chips made of Black Forest fir trees. In the course of the smoking period, which lasts approximately three weeks, the ham then obtains its typical smoky colour. Once this has been completed, the ham has to rest and mature: after 12 weeks the ham is ready for consumption. 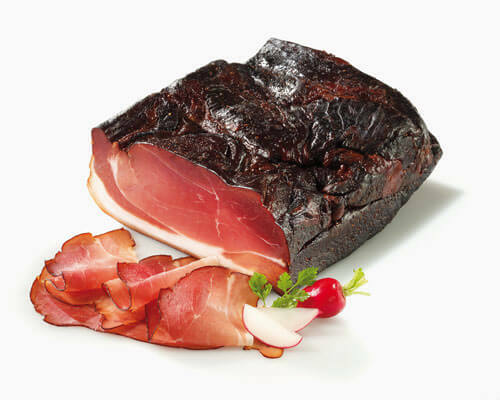 In 1997, the European Union registered the “Black Forest ham” as a PGI (protected geographic indication) for the protection and promotion of special typical regional products and foods with designation of origin. In the process of manufacturing its Black Forest ham, ADLER stringently complies with the provisions of the RAL (German Institute for Quality Assurance and Certification). In addition to this, as a member of the Association for the protection of Black Forest ham, our company advocates the general compliance with the RAL and the protection of the “Black Forest ham” description. Link to the Schutzverband der Schwarzwälder Schinkenhersteller e.V. How can one best store ham products? The best way to store a large piece of ham would be to have it in a cool room. Sliced goods should remain in the outer packaging or be lightly wrapped into grease-proof paper. In doing this, the moisture can escape and the ham’s shelf life is increased. How does the ham taste best? As is the case with a good wine, the ham also unfolds its full aroma when left outside at normal room temperature. Thus, we recommend opening the package 5 to 10 minutes prior to eating. What do the E-number additives mean? Which additives are contained here? Within the context of the Food Labelling Directive, the manufacturers of foodstuff are obliged to state additives on the product packaging, which have been allocated a so-called E-number. The manufacturer is given the choice as to whether it would like to write out these additives or merely state the E-number. Are genetically manipulated organisms processed in ADLER-products (GMO)? ADLER-products are GMO free according to the regulations (EG) 1829/2003 and (EG) 1830/2003. Which products do not contain any milk components (lactose) and gluten? ADLER Black Forest ham does not contain lactose nor mustard seeds. The EU has specified fourteen allergenic substances which most frequently are the cause of allergies. For this reason, these substances are declared on the ingredient lists of our products. Where can I buy ADLER products in the USA? You can purchase ADLER products at food supermarkets or specialist shops. To find a retail shop near you, please get in touch with us here. The direct selling outlet is located at the production building. We offer you the entire range of ADLER ham and sausage products, a lavish meat counter as well as a substantial selection of delicacy products and culinary gift articles. Our online shop only offers delivery within the European Union.